Earlier this year Jellybooks, a digital book testing and data tracking firm, shared reading analytics they had captured while tracking readers. The NY Times has an expanded article on the report if you want to see charts, graphs and more details. I have to admit that I am very pleased that folks are not afraid to put a bad book down. That used to not be the case. But there are so many good books out there, ‘life is too short’ and all that jazz. As interesting as the reading analytics are things get really interesting when you start thinking how publishers will use this. Or even authors. That’s the scary part. How would the great books of the past have been shaped had the authors known when readers “get bored” or start to skip parts? Can you imagine how formulaic plots would have become? It’s bad enough as it is. So the numbers are fun as it’s always interesting to see how people behave, but when it comes to creating art and novels that tell the stories of people, I hope authors will pause before peeking at the numbers. I just noticed last night that the Hoopla app/service I use (thanks Hoover Library!) has expanded its offerings. Movies, music and TV shows have been readily available for download since day one. But now we have access to eBooks and comics as well. * please note I have not tried to read or view comics in the Hoopla app. I am simply comparing catalogs and services at this point. 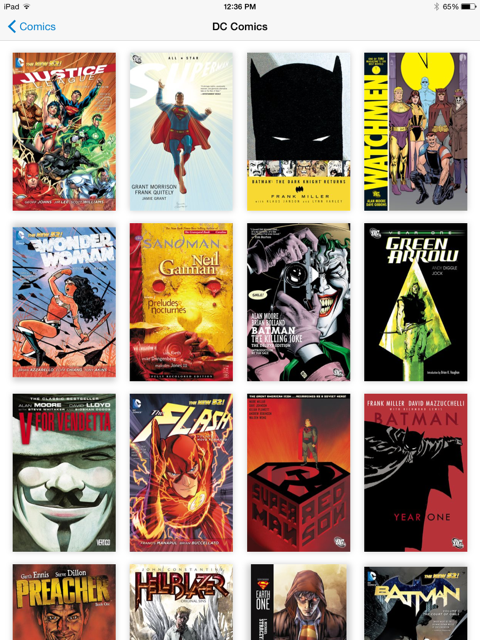 eBook readers and comic apps are hard and I do not know yet if Hoopla has a good one. I am always interested in finding new things to read and am pretty excited at seeing what the eBooks section will offer. So far it does seem to be a little different than what’s over on OverDrive which the library supports as well (thanks again, Hoover Library, you guys rock!). There seems to be a difference in publishers. Many of what is on Hoopla (while not big names) are not titles that I have access to on OverDrive. I only spot checked five books so far, but this seems to be the case. And I’m glad for it. The less overlap the better. 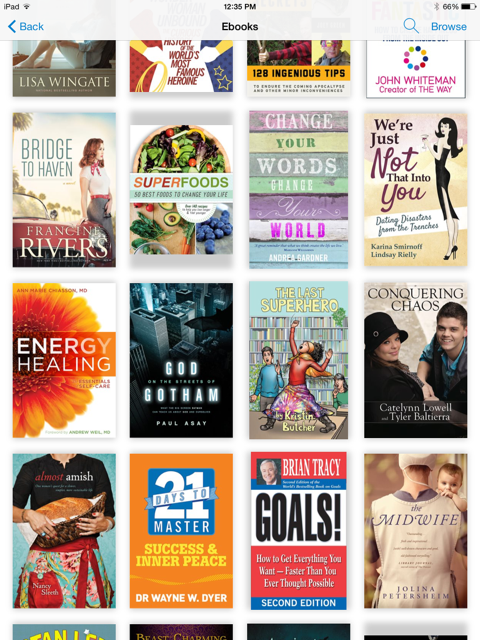 Hoopla eBooks so far as I can see seems stronger in the cooking, self-help, and Christian categories. Though there are lots of romance, kids, and some fiction as well. But OverDrive shares these strengths and is currently a little stronger in the mainstream categories. Noticably absent are Marvel comics. I have no idea if they’ll come on board or not. They’re all Disney-owned and working with Amazon, who knows. But DC Comics is testing the waters here. There are about 30 comics presented in the “Featured” area. Most of these are “digest issues” so each book contains 4-15 comics in there. Which is handy if you’re trying to catch up on a series or something. What they’re lacking in Marvel characters they make up for with. . . a Bill & Melinda Gates comic? a Kate Middleton comic? I even saw an Amy Winehouse comic book. 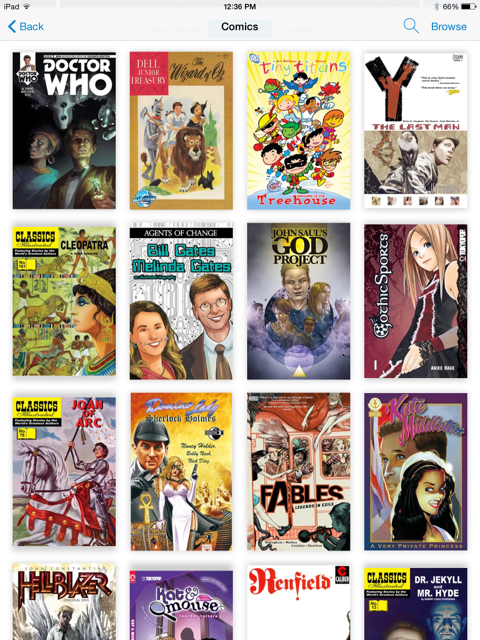 So the stock and quality is all over the map with Hoopla’s comic book offerings. No doubt it’ll get better. I assume Hoopla is the same everywhere, but maybe it is dependent on each library’s contract. How it works here is that we’re allowed 10 downloads a month. That allotment can be made up of any mix of movies, music, TV, audiobooks, and now eBooks and comics. Let me just say – libraries are awesome. I hope you live someplace with access to something like the JCLC system. To use Hoopla just load the app on your device and log-in with your library card number. You will instantly be able to access any content/services that your local library supports. Heads up book people! Apple is promoting a new Featured Collection this week – Book Lovers. Their curated list of has 29 book podcasts listed. A handful are radio or tv-related book podcasts, but the others all seem very interesting as well. I have no idea how to link to an iTunes Featured Collection. If you know how please clue me in! I can link to a specific podcast, but not to the collections. It will take you the list. I have no idea how long this book podcast list for Book Lovers has been up there or how much longer it’ll be up. I’ve listened to nine of these before and am excited to see what these others are all about. Let me know if you know of the 29 to be better than the rest and I’ll start there. 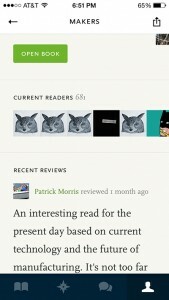 Here are two iOS ereader apps that I think you should try. Both Readmill and Marvin read ePub files and offer features that iBooks is nowhere close to rolling out. This app has quickly become my favorite app to read in. The design of Readmill is fantastic and they have pioneered many of the highlighting-type features that kindle and iBooks have adopted. What really makes Readmill great is the community and sharing aspects. 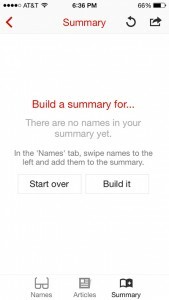 Basically, (if you turn on the features) it turns any book you’re reading into a book club. You don’t necessarily “follow people” (though you can), but while in a book other people’s highlights and comments pop up, just as if they were scribbled in the margins of a paper book. 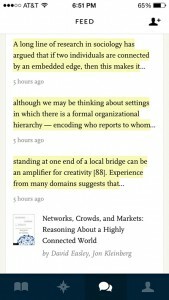 In Readmill you can reply to their marginalia or highlights and then others can respond to you, etc. You’ll have a full blown discussion before you know it… all centered on this shared experience of that very book you are reading. Of course, you can also ‘@’ people not reading the book to help promote the book or spur interest/discussions among your friends, but the idea of a group of people gathering around the shared reading of a book is fantastic. I really like the notion of discovering people to follow based on their ideas and observations alone. I have always read business books in paper. I need to scribble and make notes in non-fiction books. But I recently gave Readmill a go for a business book and can honestly say I was better for it. I stumbled on a few people, in the Readmill community, who had read it before me and made some fantastic connections inside that book. These were ideas that I may never have come up with on my own. It was a cool experience. Marvin is a fun app to read in as well, but for totally different reasons. You do have amazing controls over the color, brightness, etc. and the design is solid. Plus, they have some nifty features to help folks with dyslexia or near-blindness. Marvin also allows one-click downloads from free eBook sites, Dropbox, Readmill, ODPS, and Calibre integration. But my favorite feature of Marvin is the Deep View. 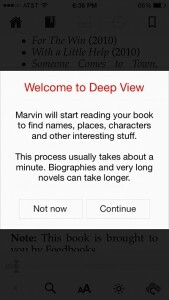 Once you click ‘OK’ the Marvin app will quickly read your whole book in about a minute. It will then offer you a list of every name in the book with external links and how the names appear to be related in the book. It will also offer you a summary of the book (free Cliffs Notes!) if you’d like one. It will also compile a list of articles about that book, article about the author, and other internet content related to the book. It’s like setting your own private wiki-pedia for the book you happen to be reading. Once you integrate that with IMDB, etc. it gets to be very very fun. I’ve found I enjoy reading older books in this app as I’m always amazed at how many author “from the days of yore” knew each other, hung out together, berated each other, or mentioned each other in their books and reviews. For every Brat Pack in Hollywood, there were at least 10 groups of authors paying attention to each other. While neither Readmill or Marvin have direct access to a robust bookstore like iBooks or kindle, these two ereader apps are worth the extra two clicks to getting an ePub side loaded to read. Check them out. I’d love to know what you think.